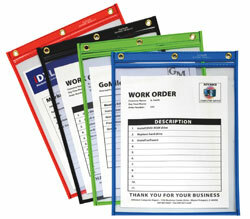 Neon Orange Stitched Shop Ticket Holders let you color code important paperwork and make special jobs stand out. Works great for organizing work by department, day-of-week or importance. Sturdy, clear vinyl construction allows for easy visibility of documents and stitched seams ensure long-lasting utility. Convenient eyelet for hanging. Orange stitched holders are packed 15 eaches per box and prices shown are per box. Please order by the box. Orange. 9 x 12. Learn about the wide variety of shop ticket holders at C-Line..